With Independence Day just around the corner, most pet guardians are aware of the dangers fireworks can pose to our four-legged friends and know how to keep their pets safe and calm during the festivities. However, once the last firework has been lit, the danger has not completely passed. Those spent fireworks littering the ground can also be a source of danger to your pets. Spent fireworks may look safe, but can actually stay hot enough to burn a curious nose, mouth or paw for some time. Also, most fireworks contain dangerous chemicals that can cause a digestive upset or worse if ingested by your pet. 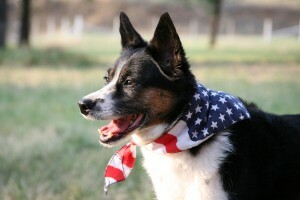 According to the Pet Poison Helpline, many fireworks “…contain hazardous chemicals like chlorates that harm red blood cells and the kidneys, soluble barium salts that cause life-threatening drops in potassium, and sulfur and coloring agents that contain dangerous heavy metals.” The extent of the toxicity will depend upon the type and quantity of fireworks ingested by your dog. What should you do? First, keep your dog or cat safely confined indoors until the fireworks are over. Carefully clear away all spent fireworks and debris being careful of “dud” fireworks that didn’t fire. To avoid the risk of fire, it is recommended that you place spent fireworks and “duds” in a bucket of water before placing in an outdoor trash can. Until you’re sure there are no remaining spent fireworks littering the neighborhood, parks, and other places your dog frequents, keep your dog on a leash and under your supervision.